Brighton was my first non-specific convention experience, aside from Destination Star Trek 2014, so I was full of anticipation attending the event. The first such event staged in Brighton, the convention was in a large, multi-level hall at the Hilton hotel. I came alone, but seemed to meet people and make friends so easily that any fear of loneliness over those two days was completely dispelled, purely from standing in the queue to get in. Despite having all the excitement of a five-year-old after too many sweets, I maintained composure as I went to see the lovely René and grab an autograph on my 1992-release The Little Mermaid VHS. I never expect much from actors at signings, as I’m sure many of them get fed up with the various over-enthusiastic fans turning up, but René was the complete opposite. I don’t think there could be a more warm and friendly man! Every fan, including myself, that went to his table was welcomed and put at ease. Even with a queue, he was happy to chat to everyone. Whether this comes from experience at conventions or he is just a natural at making people feel happy and comfortable, or a mixture of both, I will never know. But he was fabulous at it. As per usual, on both days, he was sporting some very snazzy socks and was tweeting away to his fans who couldn’t be there. The various photos of people he met at the con just summed up the fun we all had. René did a talk on both days covering a wide range of things he has worked on, past and present. The format the talks took was more of a Q and A, and the audience provided very varied questions on topics from Star Trek to Boston Legal to voice-over projects. Due to a mix up on the first day with location, I and a handful of others missed the first half of his talk, but what we managed to see was fantastic. While you may expect Star Trek questions to be a little stale, it was great to hear René touch on filming techniques used, and the classic filmmaking used on Star Trek that was more apparent when he directed episodes. He described DS9 as being darker, more neurotic, and more complex than previous incarnations, which made me smile, as I’ve been trying to tell that to the strict TNG and Original Series fans for years. René also briefly talked about Boston Legal, affectionately recalling time spent with William Shatner, who was “larger than life”. One audience member asked whether it was easier to play a serious part or a comedy, to which René explained that whilst serious actors struggled to be comic, comic actors could easily be serious. A very useful tip for any prospective actors; he certainly does have a great deal of experience! The second day talk was very different. After expressing disappointment at his lack of sightseeing (it seems like the wives and husbands of actors at the cons get to have all the fun! ), René was asked about Blood Stripe, the independent film he and his son Remy are involved in, confirming that the film is approaching the film festival circuit as it is now complete. Fans and contributors to the Kickstarter campaign will be very pleased to hear that René has seen the complete film and describes it as “stunningly good”. There was a little more Star Trek-based chat, where René touched on the fact that he prefers roles that are not based in reality, like the role of Odo. The topic of the prosthetics of Odo (we are forbidden from calling it a mask) had him recalling that mask work helps to express the emotions of a character through the body language and voice. The audience threw him a few curveballs with questions on Police Academy 5 (lots of fun to make) and M*A*S*H — both films that people only familiar with Star Trek would definitely need to go and take a look at. It highlighted how wide ranging his work has been over the years, which is brilliant for any actor not to suffer from type casting. Aside from the engaging and fascinating talks, it was a lot of fun doing the photo shoots with René. We had already been giggling like idiots on the first day of the con as it quietened down towards late afternoon, with a guy from a stall selling magic tricks (himself a magician) coming upstairs to where the guests were, and performing various card tricks for René and George A. Romero, who was seated at the next table. The first day I got a photo with René, he was so jolly and full of infectious energy – which you would not expect from a man who had not only been signing things and drawing bucket pictures to raise money for MSF for hours, but also enduring me being a complete clown trying to make him laugh all morning. The second day, the lovely Bunny and I and our little crew of congoers found him outside the talks area, attempting to get Wi-Fi to satisfy his Twitter addiction. At this point, we had a “sock off” to see who had the most impressive woollen footwear, and I showed him a snippet of the torture I had planned for him during the afternoon photoshoot; a hat that resembled a chili pepper. 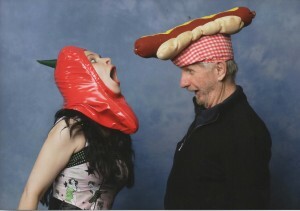 The cheeky geezer popped it on his head to Tweet it, and then had me, the rest of the photo queue, and the con volunteers in absolute fits of laughter as he wore said hat, and I donned a fetching chapeau in the shape of a hotdog, posing like inane lunatics. I don’t think any other photo will sum up how much of a fun-loving chap René really is. These were classics! For any fan who feels nervous of meeting René, don’t be. He truly made my weekend absolutely brilliant, and I definitely hope to meet him again, if only to finally win a sock-off and up my game as regards to ridiculous hats.